Montezuma's Smooth Milk Chocolate Giant Chocolate Buttons, a bag of large chocolate buttons made from 37% cocoa milk chocolate, organic milk chocolate, from Montezuma's. 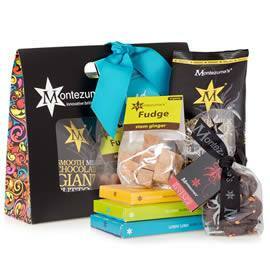 A very popular chocolate gift from Montezuma's, the giant chocolate buttons are perfect for nibbling on or sharing. Montezuma's giant chocolate buttons are also available in dark and white chocolate; Montezuma's Dark Chocolate Giant Chocolate Buttons and Montezuma's White Chocolate Giant Chocolate Buttons. A bag of giant chocolate buttons made with 37% cocoa milk chocolate, organic chocolate, from Montezuma's. A bag of delicious organic giant white chocolate buttons with a hint of vanilla for a wonderful tasting snack, Montezuma's Creamy White Chocolate Giant Chocolate Buttons. 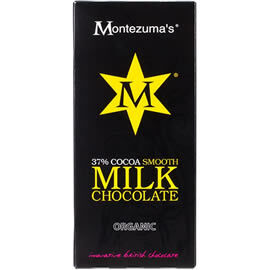 An organic chocolate bar made with 37% cocoa from Montezuma's, a smooth and creamy milk chocolate bar. Montezuma's Milk Chocolate Buttons Easter Egg with milk chocolate buttons inside, all in organic milk chocolate. 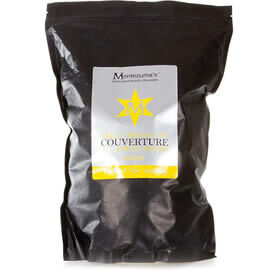 Montezuma's Milk Chocolate Couverture 2kg, organic milk couverture chocolate used by professionals and home cooks for desserts and baking. Montezuma's Lord Chocolate Gift Bag, a ribbon tied gift bag of chocolates from Montezuma's, packed full of flavour, just for the boys.